(particularly volumes and how they are measured. Rules of 3 is quite helpful). Secondary active transport when substances are transported down a gradient set up by a separate active transport eg glucose in bowel. Read “Functional morphology of the cell” once only or not at all. Ditto with the DNA / RNA / meiosis / mitosis stuff. Moles = weight in grams of 6×10^23 of a substance = molecular wt in grams. IF a substance dissociates into two 1mole = 2osmoles in an ideal solution. The osmolarity is the number of osmoles per liter of solution (eg. plasma), whereas the osmolality is the number of osmoles per kilogram of solvent. Process where a gas or substance in solution spreads into the total volume available to it by the random movement of its particles. In areas of higher concentration there are more particles moving to areas of lower concentration = net flux. Time to equilibrium is proportional to square of diffusion distance. The magnitude of diffusion is proportional to concentration gradient and cross section area. Is the pressure necessary to prevent solvent migration. It is proportional to number of particles per volume in solution. Only acts when the solution comes into contact with another across a membrane permeable only to solvent. Osmolality of a substance related to plasma osmolality. When an ion on one side of a membrane is impermeable it affects the movements of the permeable ions too eg an impermeable anion will hinder movement of a cation while encourage movement of an anion across the membrane filtration. A form of osmotic pressure exerted by proteins in blood vessels that usually tend to pull water into the circulatory system. Describe the body’s fluid compartments and their volumes. 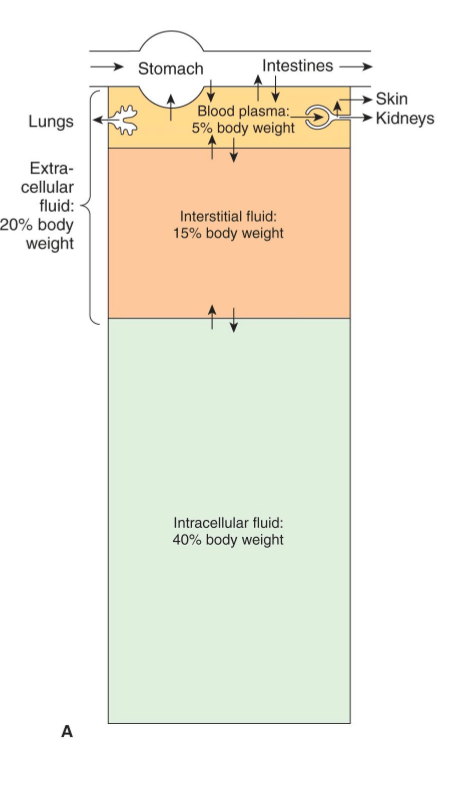 How is TBW / ICF volume / Interstitial fluid volume / ECF volume / plasma volume / red cell mass measured ? In what ways may ions and other small molecules be transported across cell membranes ? Describe the Na+ / K+ ATP-ase pump. What are the net ionic transport results of it’s operation ? What is Fick’s law ? How is the resting membrane potential of a neuron created ? What is a second messenger ? What second messenger systems can you describe ?